Months ago, I was wandering through an Urban Outfitters and this Booze Cakes cookbook was just calling to me. It's like this book was especially written for the Lush Chef! I was going to a Memorial Day BBQ with the Lush Chef Taste Testers, so I knew I had to make something especially boozy and this Tres Leches cake had a big smiley face by it. For those not familiar with this delightful Latin American confection, it uses 3 kinds of milk (thus, the name) and is served chilled– it's refreshing and delightfully rich For the alcoholic version, the whole cake is soaked through cachaça or white rum. This is the perfect adult cake to bring to picnics, dinner parties and BBQ's because of easy transport in the cake pan. - Preheat oven to 350, and grease and flour a 9x13 inch cake pan. - In a mixing bowl, cream butter and sugar for 3-5 minutes, or until light and fluffy. - Beat in egg yolks and vanilla. - Add flour and baking powder. - In a separate mixing bowl, beat egg whites until stiff peaks form. - Gently fold the egg whites into the batter (do not just mix these in, or else you're going to break the airiness you've created and your cake won't be light and fluffy). - When the cake has cooled slightly, pierce it all over with a fork. - Combine the sweetened condensed, evaporated and regular milk. - Slowly pour the milk mixture all over the cake. - When all the milk has completely absorbed, add the cachaça or rum. - In a mixing bowl, beat cream and sugar until it forms stiff peaks. Gently fold in liquor and vanilla bean paste. 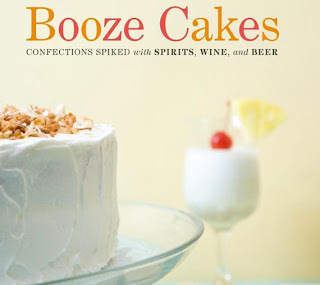 - When the rum has completely soaked into the cake, cover with whipped cream. - Chill the cake for at least 2 hours. - When serving, top with sliced strawberries. I love tres leches cake and this one sounds amazing. Such a perfect book for you too!